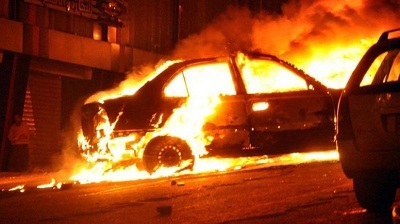 According to eyewitnesses, a green Skoda car pulled up outside the church shortly after midnight. Two men got out, one of them talked shortly on his mobile phone, and the explosion occurred almost immediately after they left the scene. On the back of the Skoda was a sticker with the words "the rest is coming" (video of car explosion and Muslims shouting "Allah Akbar"). It was reported that the bomb, locally made, had 100KG of explosives in addition to having nails, glass and iron balls inside. The strength of it not only caused glass panes to be shattered in all the neighborhood, but also made body parts fly into the building's fourth floor, and to the mosque facing the church. There was no immediate claim of responsibility but officials hastily blamed either Al-Qaida or the Israeli Mousad of being behind the blast, but none of them mentioned the Egyptian state security which is viewed by Copts as the real culprit. To clear his security forces of negligence, the Minister of Interior said that the blast was an "individual" case, caused by a single suicide terrorist detonating his vest, and has nothing to do with an exploding car. 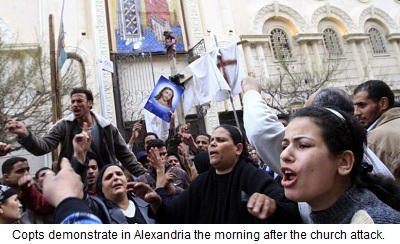 The governor of Alexandria claimed the attack as being aimed at Muslims and Christians alike. After the blast, traumatized Copts were angered by chants of "Allah Akbar" from Muslims and began hurling stones at the mosque. Immediately security forces which were absent during the car blast and the ensuing events, appeared and starting shooting tear gas at the Copts, and they in turn hurled stones at them, said an eyewitness. Fifteen Copts were rounded up from their homes by the authorities. Following the massacre of the congregation at Our Lady of Deliverance Church in Baghdad on October 31 2010, Al-Qaida threatened the Coptic Church and demanded the release of Muslim women held by the church, else Christians everywhere would be their target. As a result Egyptian authorities supposedly stepped up protection around Copt places of worship after President Mubarak said he was committed to protecting the Christians "faced with the forces of terrorism and extremism". "Security should know that those who demonstrated are the hand of Al-Qaida in Egypt," said Hany el-Gezeiry, head of Copts4Egypt. "They should have arrested them to investigate who was behind them. They want to destroy Egypt from inside and the government kept quiet, giving them a free hand to do what they wanted. I believe Al-Qaida achieved what it wanted." El-Gezeiry asks why this Skoda vehicle was allowed to park in front of the church in an area cordoned off by security, when it was known that Al-Qaeda had already announced its intention of carrying out criminal acts against churches. Eyewitnesses confirmed that security forces guarding the church withdrew nearly one hour before the blast, leaving only four policemen and an officer to guard such a big church and nearly 2000 people attending the midnight mass. "Normally they would have waited until the mass was over," said el-Gezeiry. He also commented on the Muslim's schadenfreude at the massacre at the church, who were heard chanting "Allah Akbar." On January 6 2010, just before the Christmas Eve Massacre in Nag Hammadi, security withdrew its forces from guarding the church a couple of hours before the shooting of the Coptic congregation took place. Attorney Mamdouh Nakhla, Head of Al-Kalema Human Rights Center, wondered if state security is an accomplice or just too cowardly to confront the Islamists in Egypt who carried out the Church massacre. "The crime is local and those who committed it are known, in addition there was a demonstration on the same day using the same rhetoric like al-Qaida. The Al Mujahedeen website threatens to repeat the attack in more churches. The site has addresses of churches and even how to make a bomb. Does security not know about it?" "Anyone who says that it was a foreign or Israeli plot is trying to play down the crime and is trying to clear those murderers of this massacre, and I consider them their accomplices," said Nakhla. Nakhla said that he was preparing a complaint to be presented to President Mubarak asking for the resignation of Interior Minister Habib el Adly for failing in his duty of protecting the Copts, and for not telling the truth by saying that it was a suicide attack by one individual, when everyone could see the detonated car, just to clear his security personnel of the responsibility of letting the Skoda park in front of the church. "This 100KG bomb could not have been transported by one individual as the Interior Minister wants us to believe." On January 1, the funeral of the 21 people killed in the church massacre took place at St. Mina's Monastery in King Mariout, 50 km from Alexandria. It was attended by representatives of the President, Minsters, the governor of Alexandria, as well as nearly 10,000 Copts who traveled from Alexandria. After the funeral, the Copts, angry with the governor of Alexandria, shouted "resign" and "we do not want you."